Yesterday, 500 educators had the opportunity to learn. I was fortunate enough to be one of them as a guest of the Costen Foundation for the Art of Teaching. Since 2001, the Costen Foundation has provided professional development for teachers. My students and I are indebted to organizations such as Cotsen, who develop teacher-learners. This post is a reflection on yesterday. I hope some of it inspires you as it did me. Lovely is an idea that is Katherine Bomer. She embodies a passion for learning and pushes our understanding of teaching. Years ago, she taught me to value my students’ writing by looking for the gems, not the errors. That changed me as a teacher. Yesterday she did it again with the idea of an essay. Not the five paragraph kind so many teachers ask their students to do. A “true” essay, as Bomer calls it, is a journey. One that makes connections, and in the end comes to a place that isn’t just a thesis state ment with three supports, but a view of our thinking around and about an idea. It’s filtering thinking through the writing process. Rather than the hamburger formula of essay think of it as a collage, a road, a mosa ic of thinking. It’s an exploration. More like jazz. A mashup, unified around a central idea. It’s narration of thinking. It entertains and engages. Stand up comics are some of our best essayists. It can take you down a road to discovery. Can you imagine your students going there? I certainly want mine to. Christopher Lehman was next on my schedule. Think of the notes your students take. If your students use notes as a means to copy the text word for word, these strategies can move them towards thinking and learning. As I write this post, I loo k back at my notes. I re-read and consider my thinking. I start to own it. I notice patterns and collect ideas. I notice how it connects. By doing this, I add my voice to the notes. That’s what we want our students to do. We want them not just to take notes but to use them. The strategy of read, think, cover, and note can capture student thinking about the text rather than copying of the text. Going back and re-reading allows readers to search for vocabulary that an expert might use or to look for concepts or information missed in the first read. If your students have some knowledge of note taking, review those tools. 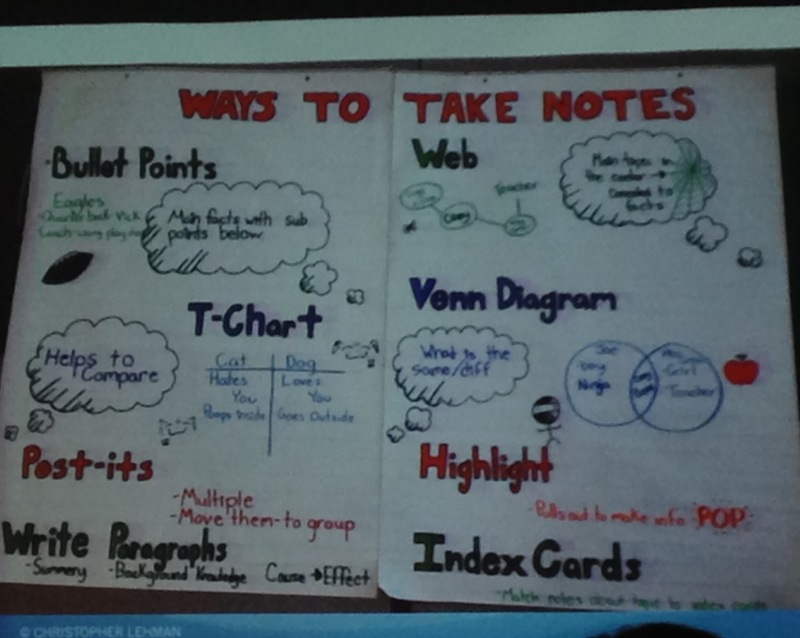 Encourage the use of notes by having students do something with them. Add color. Sort their notes. Re-read and add in what the notes make them think. Note taking should become a student tool for thinking. Not a recording of what was read. The last session of the day was building vocabulary with Kylene Beers and Bob Probst. I have a love/hate relationship with vocab. Love the power of it but hate the fact that I can’t do enough for my students. Kylene and Bob took the stage and engaged us. Exactly what we need to do to raise the “rigor” of our instruction. The blonke was mailly, like all the others. Unlike the other blonkes, however, it has spiss crinet completely covering its fairney cloots and concealing, just below on of them, a small wam…. It was probably his bellytimber that had made the bloke so drumly. The three types of words we chose mattered. We didn’t need to know every word but, we needed a few key ones to make meaning. Consider building vocabulary around words that give context, are related to cause/effect, or create tension in the text. Consider building vocabulary around multiple meaning words rather than the bolded words many textbooks highlight. “The tsunami was triggered…” Students know about the trigger on a gun. But how does that relate to a tsunami? Consider building vocabulary around words that students might have some understanding of, but don’t make sense in context. “He was appointed to lead the committee.” Students know they make an appointment with their dentist. But how does this connect to this text? We can’t teach students every vocabulary word they need to know, but we can teach the kind of words they need to know to understand a text. Think notice and note for vocabulary. That’s vocabulary work that sticks and grows with the reader. This session ended after 3 pm. Several of us sat after most had left, sharing our thinking. We were engaged and energized. We were lucky to be there. Thank you, Cotsen for believing in teachers. For developing teachers as professionals. That’s the best thing you can do for our students. I was thinking of you all day yesterday and imagining what you were learning…and her you go, sharing it with us – perfect! Thank you! Thanks, Julieanne, for sharing your day and learning from Katherine, Chris, Kylene and Bob. The mosaic of your learning in this post is another example of how your “notes” were processed and the journey of your own thinking! Wow! What a wonderful workshop! Thanks for sharing all the insight you gained. Note that your blogging helped you process and glean what you could apply to your own teaching. I want to return to this post.